I have a confession to make. When I started doing book reviews on my blog, I may have mentioned that I only like to read and share books that are happy or uplifting. Unless they are written by Elizabeth George, who is my favorite author of all time. While her books aren't exactly warm and fuzzy, they are so suspenseful and well done, I'm never able to put them down. Now that fall is here, it's time to cozy up with a juicy murder mystery, and the Inspector Lynley series by George is the perfect choice. None of George's books are simple whodunit's - she is a talented storyteller, and her novels are more about the people than the crimes. While each book in the nineteen volume series focuses on one specific case, the common denominators are Inspector Thomas Lynley and his trusty companion Detective Sargent Barbara Havers. Their struggles and successes are interwoven through all of the books, and they are such fully developed characters, I feel like I could walk into Scotland Yard today and find them working there. Every book is full of psychological suspense, moral and ethical questions, and a complex murder mystery. Even though George is American, these are authentic British novels, and she obviously does extensive research on the locations and culture of each story. If you enjoy compelling, beautiful storytelling with a dose of skin crawling crime thrown in, I suggest starting with the first book, A Great Deliverance, and working your way from there. 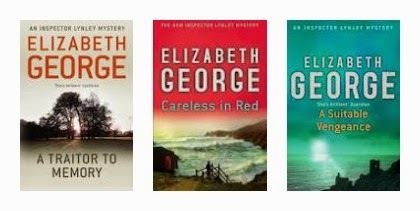 Elizabeth George actually lives on Whidbey Island, Washington, which is only thirty minutes from my home. She and her husband just put their gorgeous estate up for sale, as they are planning to move to Seattle to be closer to city life. To see pictures of this stunning home, go here. If I had a spare $5.5 million dollars lying around, I'd probably go check it out! I'm pretty sure I could live quite happily in her sitting room. I love when you give book recommends!!! I'll have to put her on my "authors to read" list! I love a good mystery! If you love mysteries you will really enjoy her books. I love suspense and mystery, thanks so much for sharing this...I will definetly give her a try. I've been searching for a new favourite writer. And I love mysteries! Going to take your recommendation!!! Isn't that house gorgeous? Too big for my tastes, but very pretty and the view is beautiful. Give her books a try - you will enjoy them. I'm always looking for new books to read! Thanks for the recommendations! I love that house! Thank you for introducing me to Elizabeth George. Believe it or not, I've never heard of her but will be happy to check out her books! I have never read any of her books but I pinned it for later. Well I went on a little adventure. Mom and I took a helicopter ride my first her 2nd. We both loved it. They took some great pics of us. A couple of hours later I took one for her to put up on her wall in her room and she didn't even remember going. Oh Lana it just broke my heart. It just deflated me. I'm so sorry that your day turned out that way. I sent you an email about it. Have you gone to an autograph signing since she's so close to you? Have you tried corresponding with her about writing a book yourself? Imagine if someone contacted you who appreciated and valued your writing so much that they contacted you. She would be a perfect mentor for your writing process! Take the risk! Lana...reach out to Elizabeth George! It's meant to be! This is such a great book review. I love the way you have personalized it, and added so many fun facts. I can't imagine giving up a home on Whitbey Island for city life though!